Republican Secretary of State Kim Wyman, left, and Democratic challenger Tina Podlodowski. 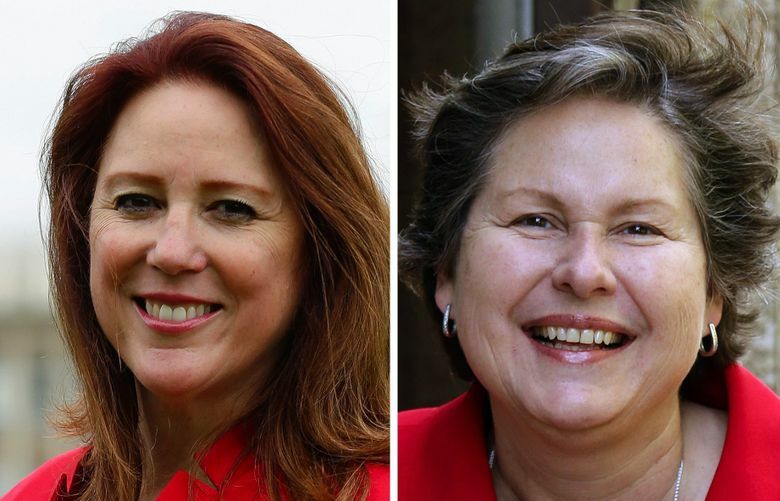 Voter turnout is a major issue in the race for Washington secretary of state, as incumbent Republican Kim Wyman tries to hold off Democratic challenger Tina Podlodowski. Washington’s voter-turnout rate, which has lagged in recent years, is playing a major role in the race for secretary of state, with Democratic challenger Tina Podlodowski charging that Republican Secretary of State Kim Wyman has not done enough to make it easier for people to cast a ballot. The state has seen lower turnouts in recent years, and Wyman’s claim, on her website, that Washington leads the nation in voter registration is not accurate. But Podlodowski paints a misleading picture, comparing turnouts from elections that have little in common. Studies show the solutions she proposes — many of which Wyman also supports — would lead to more people voting, but most could not be done solely by the secretary of state and would require changes from the Legislature. Both candidates are strong supporters of Washington’s 5-year-old all-mail voting system. Evidence is mixed on the long-term effects of all-mail voting, but one recent study estimated it boosted turnout in Washington by 2 to 4 percentage points. The race to be Washington’s chief elections officer could be the most competitive statewide contest this fall — Wyman won the primary by less than 2 points — with Podlodowski aiming to end a 52-year Republican grip on the office. Podlodowski is a former Microsoft executive and Seattle City Council member with no experience overseeing elections. She has raised more than $510,000, about $65,000 more than Wyman, a former Thurston County auditor and elections manager finishing her first term as secretary of state. That difference is mostly attributable to a major edge in dollars from out of state for Podlodowski. The secretary of state supervises and certifies state and local elections, registers businesses and charities and runs the state library and archives. Wyman calls elections administration “my career and chosen profession.” She would like to move Washington’s presidential primary earlier in the voting season and touts accomplishments like making it easier for special-needs voters to vote and providing election information in multiple formats and languages. Podlodowski has campaigned on a more aggressive platform of changes to Washington’s voting system. Podlodowski launched her campaign in January with a video showing a plunging line graph, superimposed over Wyman’s picture, with voter turnout decreasing from 81 percent in 2012 to 38 percent in 2015. That’s not a fair comparison. In 2012 Washington voters chose a president, a governor and a senator. In 2015, they voted on five tax initiatives and penalties for selling endangered species. But turnout in off-year elections (held in odd-numbered years) has declined since 2011, setting a record-low last year. Turnout statewide dropped from 53 percent in 2011, to 45 percent in 2013 and 39 percent last year. Wyman says that’s part of a national trend. She said Washington still had higher turnouts than most places. Still, Wyman’s claim on her website that “Washington state leads the nation in voter registration, security and elections innovation” is not accurate. Washington ranked 15th in the percentage of its eligible citizens who were registered to vote in 2014, according to census estimates, and 24th in 2012. Podlodowski wants an audit of the election systems in each of the state’s 39 counties to look for obstacles that may be keeping people from voting. “There are two pillars of what I believe the office is about, which is 100 percent of the people who are eligible being registered and 100 percent of those people voting,” Podlodowski said. Wyman, who supervised elections in Thurston County and was county auditor for 20 years before becoming secretary of state, often talks more about the successful administration of elections than big changes to the system. She frequently tells a story of how, when she and her husband lived in Germany, where he was stationed with the Army, they received their absentee ballots the day after the election. “It’s easy to take shots at performance and be critical of an office; it’s difficult to do the work,” Wyman said at a recent forum sponsored by the League of Women Voters of Washington. Academic studies show that the changes that Podlodowski advocates — same-day voter registration, preregistration for 16- and 17-year-olds and prepaid ballot return envelopes — would encourage more people to vote. But most, if not all, could not be implemented without a bill from the Legislature. You have to be 18 to vote, but in most states you don’t have to be 18 to register to vote. Twenty-eight states have some form of preregistration, which lets teenagers register in advance of their 18th birthday. In Washington, you can register if you’ll be 18 by the next election. Podlodowski would like to let 16- and 17-year-olds preregister and thinks she could make the change administratively, without action from the Legislature. Wyman wants preregistration, but just for 17-year-olds, and clearly does not think it’s a change she can make on her own — she asked the Legislature for a bill to change it earlier this year. That bill made little progress. A 2010 study of voters in Florida and Hawaii — both of which let 16-year-olds register — found that preregistration, combined with outreach programs, increased turnout among young voters by about 2 percentage points and that those who preregister are more likely to vote over several election cycles. Currently 16 states allow same-day voter registration — letting you register and vote all in one trip. Podlodowski wants Washington to join those states, many of which lead the nation in registration. Wyman does not. She thinks same-day registration would put too much stress on Election Day officials. Podlodowski’s campaign said options in Washington — which doesn’t have Election Day polling places — could include same-day registration at a county auditor’s office or at election-day voting centers in each county. A 2014 study by Demos, a progressive think tank, found that voter turnout in presidential years is consistently about 10 points higher in states with same-day registration than in states without. Several other studies show a boost in voter turnout of about 5 percentage points after states implement same-day registration. Three states — Washington, Oregon and Colorado — vote entirely by mail. But a lot of voters don’t return their ballots by mail; they deposit them in a drop box. Nearly 40 percent of Washington voters dropped their ballot off at a drop box in 2014 rather than by mail, according to data from the Survey of the Performance of American Elections. Nearly 35 percent of those voters who used a drop box did so to save money on stamps, the survey found. A bill to offer prepaid postage for returning ballots went nowhere in the Legislature last year. Wyman’s office said at the time that she supported the bill in theory but had concerns about cost and the ability to accurately postmark the return ballots (prepaid postage is not normally postmarked and ballots must be postmarked by Election Day to be counted). The state Office of Financial Management estimated it would cost between $2 million and $3 million per two-year budget cycle to offer prepaid postage.